The Sahel is the transition between Savannah and Sahara desert. The word 'sahel' is derived from the Arabian 'sahil', which means 'shore', the shore of the desert. Living in the Sahel is a toss-up. 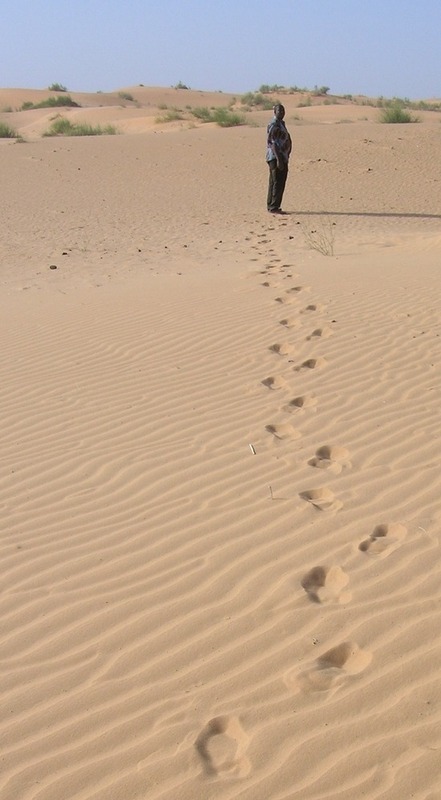 Desert people (Peul, Touareg and Bella) get the maximum out of the minimum. Agriculture in the sand is nearly impossible. Cows, sheep and goats are on the go, along with their shepherds (or the other way around), looking for water and grass, to be sold eventually on a livestock market. This is the third and last photo album of our dads' visit to Burkina Faso. Who's next? Que veux-tu que l'on soit ? In Oursi, we sleep at the camping place of a smart Burkinese guy. For tourists, it is the most splendid place to spend the night: sleeping in Touareg huts, drinking cold (!) beer, and showering beneath a star-spangled sky. These women belong to the Bella people. Gorom-Gorom's Thursday market is a salesmen crossroad. On the first place, cattle is being sold (cows, sheep, goats, donkeys and camels), to be transported and sold again in the capital our in the neighbouring coastal countries. Bani has got its own Moslem prophet who believes to be more important than the one from Mecca. The grand mosque has been built in 1979, and the story is so bizarre that scandalmongers pretend that the only reason for building it was to please tourists and gain money… Howsoever, the mosque is very beautiful.